❤️Buy Real Instagram Followers for Cheap - From $0.008 per follower! Buy Real Instagram Followers for Cheap! Yes! 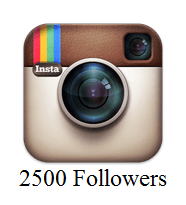 You will buy real Instagram followers from us. We will not subject your profile to bots like a majority of sellers out there. We aim to make your profile valuable. The followers you’ll get from us will help you grow your audience and establish your credibility which will, in turn, get you more followers. Will these accounts unfollow me? That rarely ever occurs. The Instagram followers from us have long retention times. They will always provide a ready audience for your posts. These followers will remain even as your follower base increases. If you ever notice a drop, make sure you contact us via our contact page for free replenishments. Yes! SocialGrand uses only the safest methods in the industry to get you cheap Instagram followers. We comply with all relevant policies and best practices. Your account safety is our top priority. We will help you achieve your goal of more followers using only approved strategies. We highly value your privacy. We use SSL protection throughout the site. We are also compliant with data privacy rules and regulations. We never ask for your account password. The information you submit such as your username or email will not be shared or sold. We store such information securely after encryption. You will always remain in total control of your account. How fast will I start receiving the followers? At most, you will wait only a couple of hours to see results. For a massive platform like Instagram, we know that time is important. Therefore, we work fast after you make your purchase so that you can begin to reap the benefits of increased followers. But if you don’t see an increase in 24 hours, contact our team for assistance. You can pay via Paypal or Coinpayments.net. Both of which are secure online payment methods. All your transactions will be kept confidential. Use your credit card with Paypal or crypto coins at Coinpayments.net. You will find these payment gateways convenient and easy to use. Plus, your payment will be processed quickly. If you encounter any issues with payment, kindly contact us. The truth is, though there are more than 500 million daily users on Instagram, getting new followers is tough. If you are starting out, you'll be overshadowed by popular accounts. And if you've got a good following, it's not strange to go through a follower stagnation phase. In addition, Instagram is constantly rolling out new updates and changing algorithms. To overcome these challenges and make an impact on this massive platform, you've got to do more. You can build your audience by buying Instagram followers. Face it: the number of followers you have on social media matters. Of course, you must have great content. But with a limited number of followers, your impact is greatly reduced. Ever checked out an Instagram profile only to find less than a hundred followers? I bet your first reaction is to get out of there. The opposite reaction is expected when a user lands on a profile with tens of thousands of followers or more. If you have lots of followers, new users are likely to follow you. They immediately think that your content is excellent and that's why so many people are following you. So, they join the pack. They don't want to miss out. This is what makes social proof so important. It makes people pause to find out more. This article posted on Shopify argues that social proof is one of the most important marketing assets. If you want to build your social proof and attract more followers, increase your Instagram followers today. Research has shown that many users are likely to buy a product endorsed by an influencer. Why? More people are turning away from traditional advertising and getting all their information from social media platforms. Plus, influencers are human and they provide authenticity. People trust them and engage better with them. Therefore, top brands seek to partner with them because they can get a post to a huge audience at the click of a button. This always results in a nice income for the influencers. So lucrative is the influencer status that HopperHQ now creates an Instagram Influencer rich list to showcase the top earners. And at the very top of the first list is Huda Kattan, a young entrepreneur who charges up to $18000 for a product endorsement. Imagine making that kind of money for a single sponsored post. Now, that’s a great income. As you can see, the influencer status cannot be underestimated. Even if you can boast of a large following already, having an account that is constantly attracting new followers is invaluable. Stagnation is bad. It shows your content is not attracting the attention of new users. Buy Instagram followers to help you get to influencer status or shake up a profile that is not getting any new followers. Research has shown that more consumers are searching for brands on Instagram. And if they land on your profile and find lots of followers, they're likely to buy, convert or follow. One reason digital marketers like Instagram is because every post will show up on each of your followers’ feeds. This is not the case on Facebook. So Instagram provides an amazing opportunity to take your digital marketing to a whole new level because you get to reach a wider audience. In fact, Instagram has one of the highest conversion rates of any social media platform. Plus, customers can buy directly from your profile. If your goal is to make sales, then getting more Instagram followers will increase your customer pool, for sure! One of the stats that is making Instagram the preferred social media platform is that it has a higher engagement rate than Facebook. So, having more followers will lead to increased engagement on your profile. This, in turn, provides you with valuable feedback and insights into your brand’s effectiveness. With this information, you can improve your content, products, and services according to your customer needs. Therefore, Instagram is the best channel for any brand or business looking to improve. You can get real feedback from your followers as to what they like best and what they’d love to see in the future. Thus, you can develop your products and services to be more fulfilling to your customers. Increased number of followers means more valuable information. Want an edge over your competition? Then, increase your Instagram followers. As mentioned above, more people are connecting with brands and businesses on Instagram. So having a good following will make you stand out whenever a user makes a search using a term connected with your profile. Your visibility will improve because you get a higher rank on the explore tab. In addition to this, more followers can boost traffic to your website via the links in your bio. As more people check out your profile the chances of users clicking on the link to find out more improve significantly. You cannot let your profile be at the mercy of ever-changing algorithms. For real growth, buy real followers on Instagram. This will help keep you at the top especially where your niche is concerned. Instagram Followers Overall rating: 4.8 out of 5 based on 127 reviews.